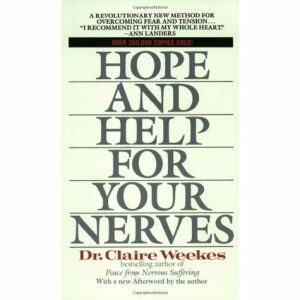 Hope And Help For your Nerves by Dr Claire Weekes is the gold standard by which I judge all other panic/anxiety “cures”. Dr. Weekes did an amazing job not only explaining the basis of panic disorder, but also in explaining in clear, concise language what needs to be done to address what she described as an “illness of how you think”. This book is inexpensive and in my opinion should be required reading for anyone dealing with anxiety, panic attacks, or panic disorder. My friend Holly thought it might be helpful to break down Dr. Weekes’ book chapter by chapter in a podcast/videocast format, so here we are. This is our episode on chapter one of the book – The Power Within You. Grab a copy from Amazon (or Abe Books in the UK as per Holly) and follow along with us!